A woman came to the office because of sharp epigastric pain. On physical examination nothing was wrong except of epigastric pain. An endoscopy was performed and reported as normal. 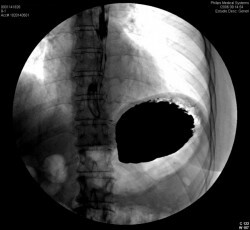 An Upper Gastrointestinal Tract Barium Examination was ordered and we found a cascade stomach, which is a rare finding. We exlude other causes of abdominal pain in the first place. As you can see in this series, the fundus, still lies in its usual position relative to the structures of the left upper quadrant but the proximal portion of the body of the stomach is in an abnormally anterior and superior position. 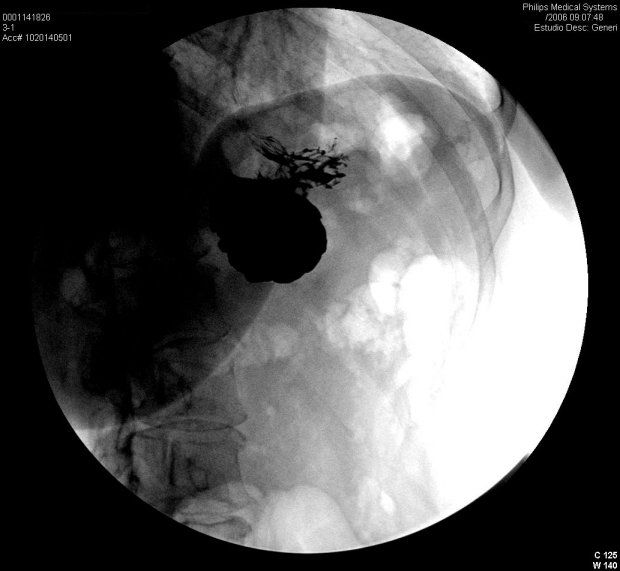 When this type of stomach is filled with barium (erect position), static roentgenograms may demonstrate a separate fluid level confined to the fundus. At fluonoscopy, barium first fills the dependent, posterior fundus to the highest level of the â€œridgeâ€ and then spills or â€œcascadesâ€ into the body and antrum. On the next day we have performed an esophageal manometry and the patients had lower esophageal incompetence, so we performed a laparoscopic Nissen fundoplication with gastropexia. Now the patient is painless and in excellent condition. I am Indonesian woman. I went to the doctor because I feel there are a lot of gas in my stomach. When doing endoscopy, doctor said I have cascade and the position of my stomach is abnormal. So the gastrointestinal pipe was difficult to go through. What is the cascade caused by and how to improve it? I have systemic lupus and APS. My thyroid and ovary already taken out because of hyperthyroid and cyst. Last year I got vistel too. Do all my disease related each other? Really want an explanation what should I do. I was also told i have cascade stomach back in september and i don’t know what it really is. All the dr told me was that i had cascade stomach and left it at that, should i be worried, should i look further into it, i still have these awful abdominal pains daily and i can’t seem to find anything on the internet regarding cascade stomach other the definitntion. I’m 36yrs old i have gerd, sle fibromyalgia and histiry of stomach ulcers. If anyone can find outmore nfo on cascade stomach please post it, any ifo would help. Not sure if someone still reads these posts, as the last one was in 2006 but i was wondering if someone could answer my question. I too have a cascade stomach(they found out by accident when they did a gastroscopy) and have a lot of problems with eating. I feel very tired and ill straight after meals and my stomach plus my intestines swell up a great deal. I look as if i have a pregnancy in my stomach as well as in my intestines after several meals. Could this be caused by my cascade stomach? 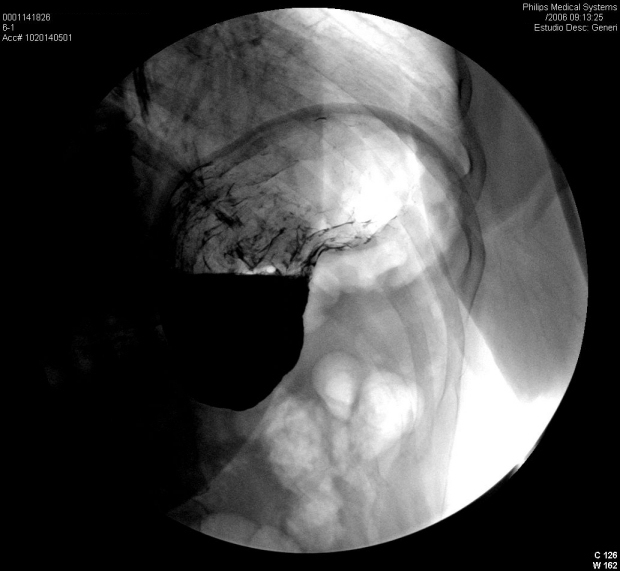 It’s very often to find this “cascade stomach” as an accidental finding and it’s often that patients with this condition doesn’t have symptoms. In those with symptoms, surgeons have to rule out other causes of pain and if there are no other causes of pain, sometimes we perform a Nissen’s laparoscopic fundoplication surgery. I am 41 and i am from Europe, Bulgaria. I have absolute the same problem and after all the procedures were performed they told me evrything’s OK and that i have “nervous syomach”! They prescribed for at least an year- Seropram that I take since April , 2006 !Nevertheless there ‘s still that cascade stomach, though it’s much weaker! Besides I take Nexium- 2 mg, for abot a week ! Un fortunately, nobody can prescribe me any treatment,except “good food & a quite life”! Are there any good medicines(or any other treatment) for that condition , that are able to be find in Europe (Eastern)?